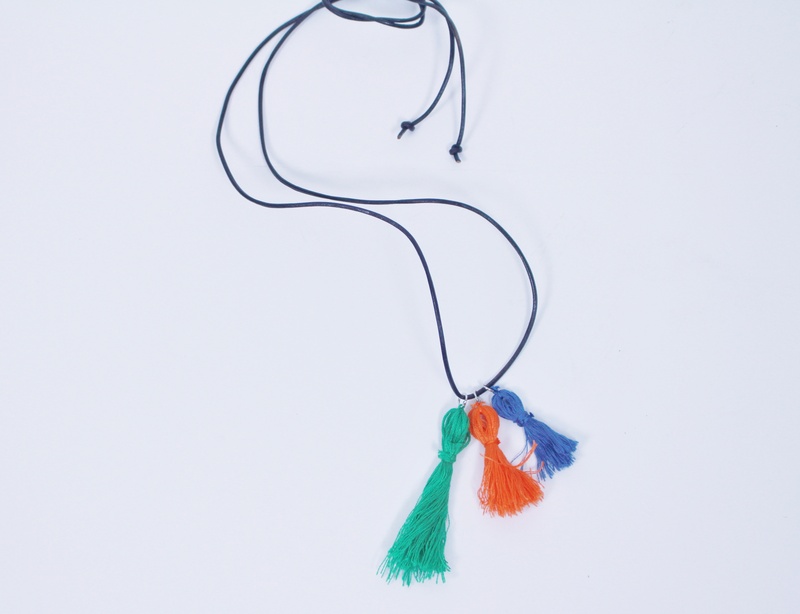 Tassels hand pom Poms have long adorned clothing and accessories. From the ends of strings on a peasant blouse to decorating the perimeter of bohemian style cushions. 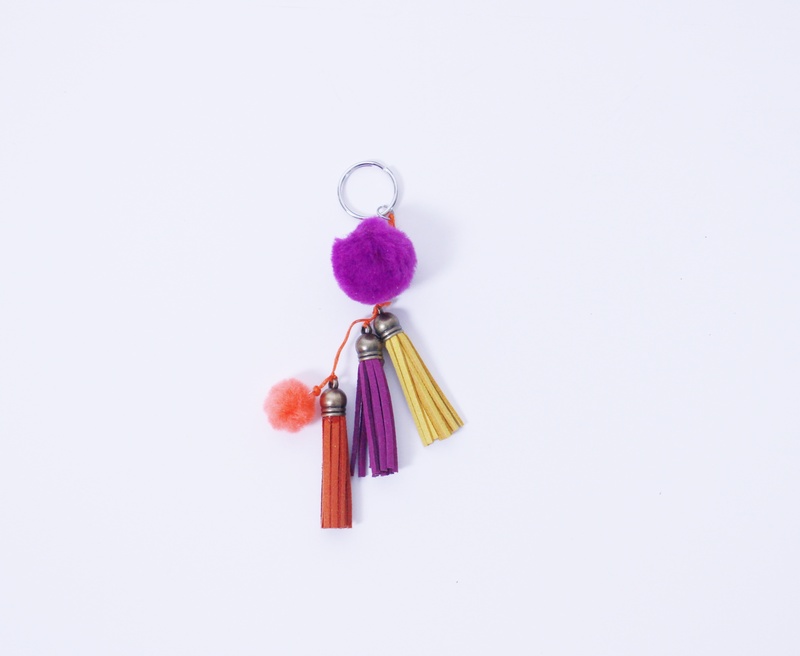 For the past three springs and summers tassels and pom poms have been out in full force, dotting otherwise mundane items with dots and splashes of colour and texture. I actually thought this trend was winding down but look and behold it continues to be ever present from runway to the racks of fast fashion stores. 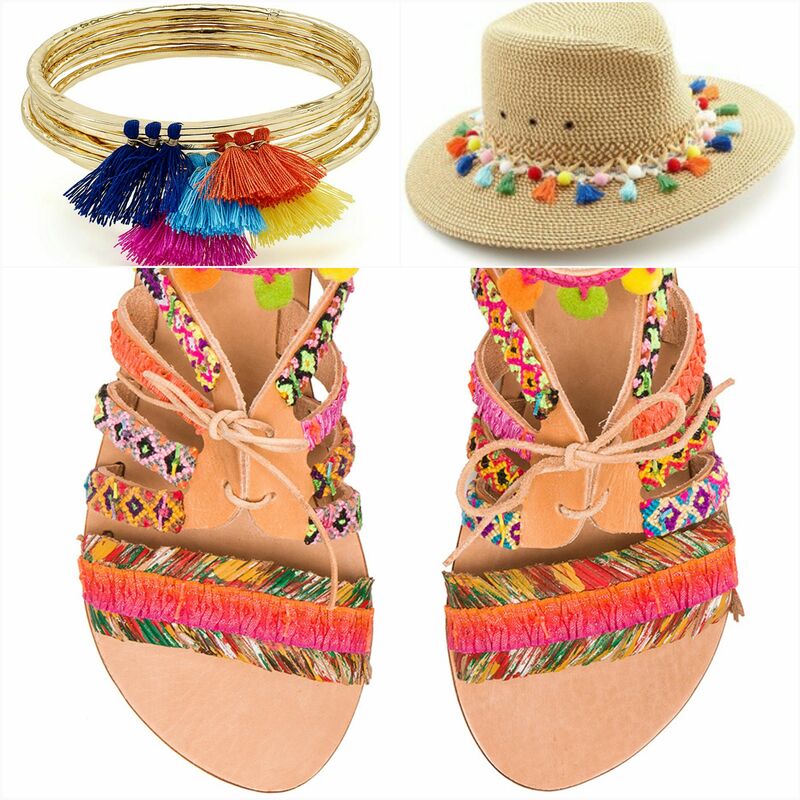 Tassels bangles by Aqua Lilith $41 US, Pom Poms and Tassels hat by Eric Javitz $250 US, Pom Pom sandals by Elina Linardaki $225 US. This trend is easy to wear. 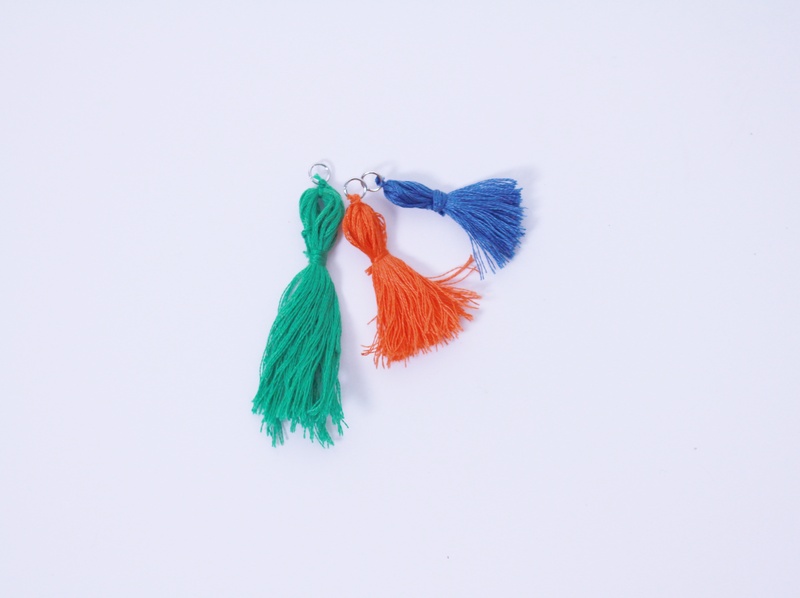 You can make any look fun and bright with tassels and pom poms, going from zero to vacation mode in seconds. You can shell out some serious coin for a designer item or pick up something more affordable from off price retailers or fast fashion boutiques. OR, you could DIY! That’s exactly what I did. I decorated a pair of espadrilles, a cross body bag and made a necklace. Length of leather, rope or chain. 1. 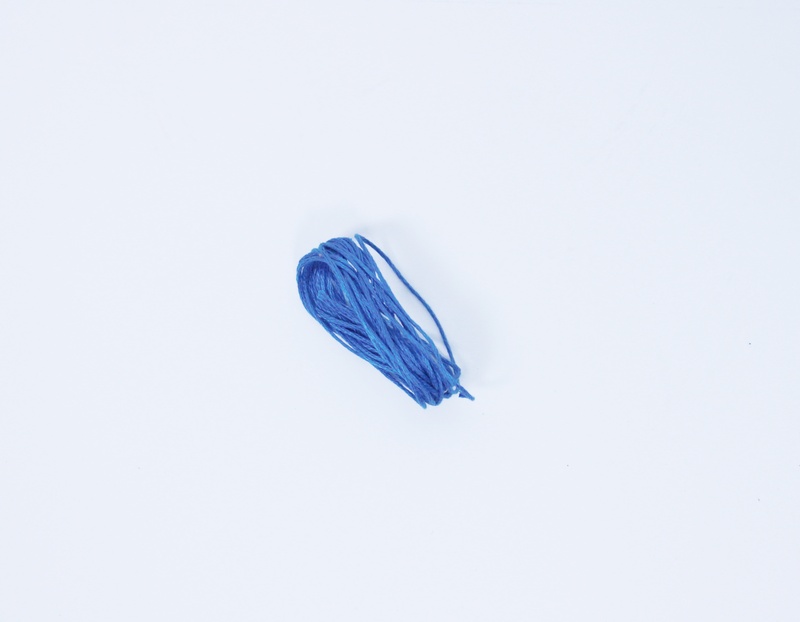 Take a length of the thread and wrap it around three fingers multiple times. The more you wrap, the thicker the tassel will be. Alternately, you can use a square of card board, the with determining the length of the tassel. 2. 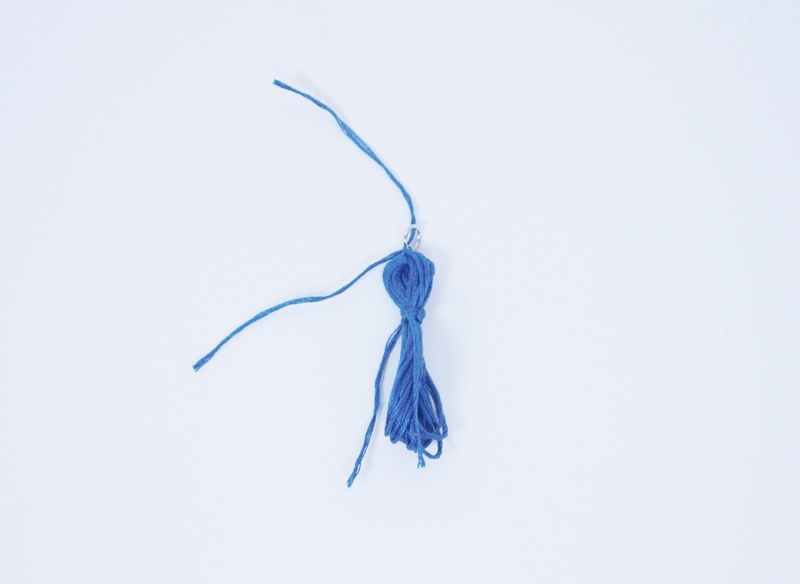 Cut a short piece of the embroidery thread and tie it approximately 1/4 way down the tassel. Make a few wraps then tie off. 3.Thread a piece of the embroidery thread through the top loop and tie off. Add a jump rings and knot. 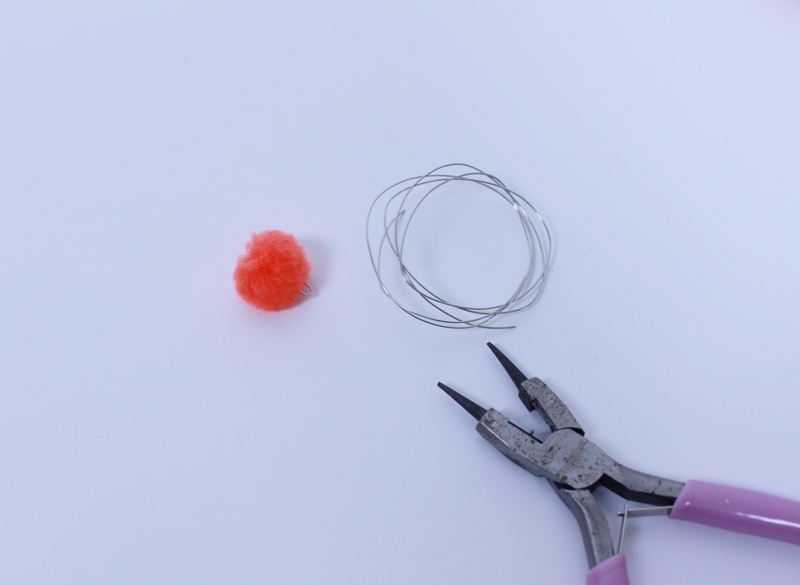 4.Cut off all the loose ends, then trim the bottom loop to create the fringe. 5.I repeated this twice using different colours and creating varying length fringes. I also combed through the thread with a fine toothed comb to make it fluffy. 6. Slide onto faux leather and tie ends together . Shoes- I used a pair of espadrilles with laces. 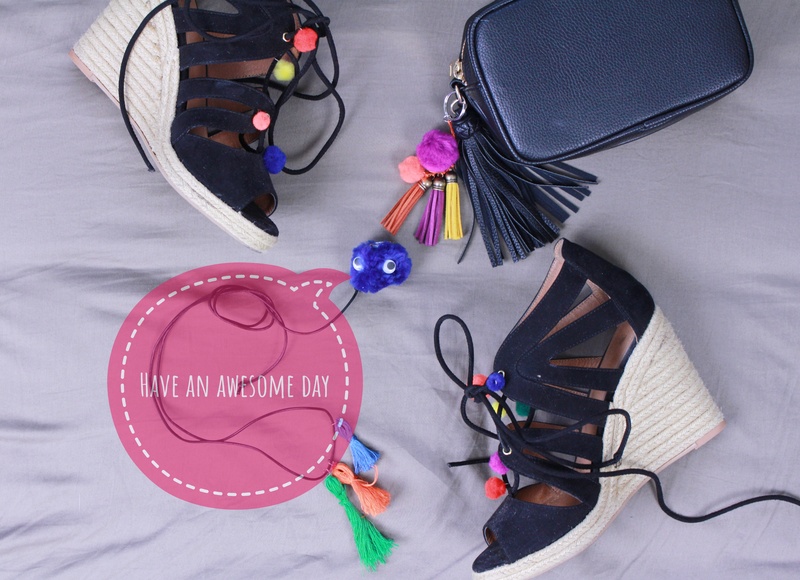 You can use gladiator sandals or any other shoes with laces. Pom Poms-These can also be easily DIY’d using yarn but they are very cheap and accessible from craft and stationary stores. Eye pins- These are the small metal pins with loops at the top. They can either be bought from jewelry supply stores or you can make one yourself with jewelry wire and a round nosed pliers. 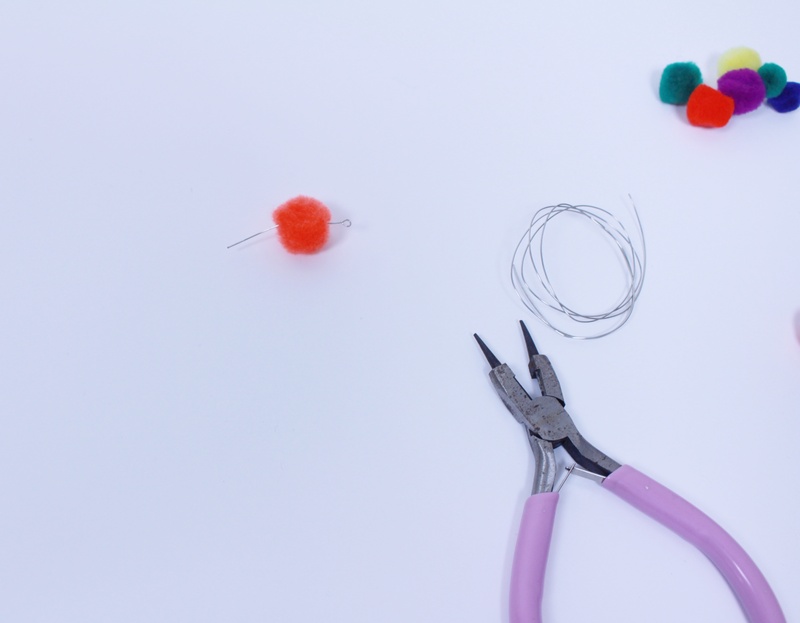 1.Push the eye pin through the Centre of the pom poms. 2. 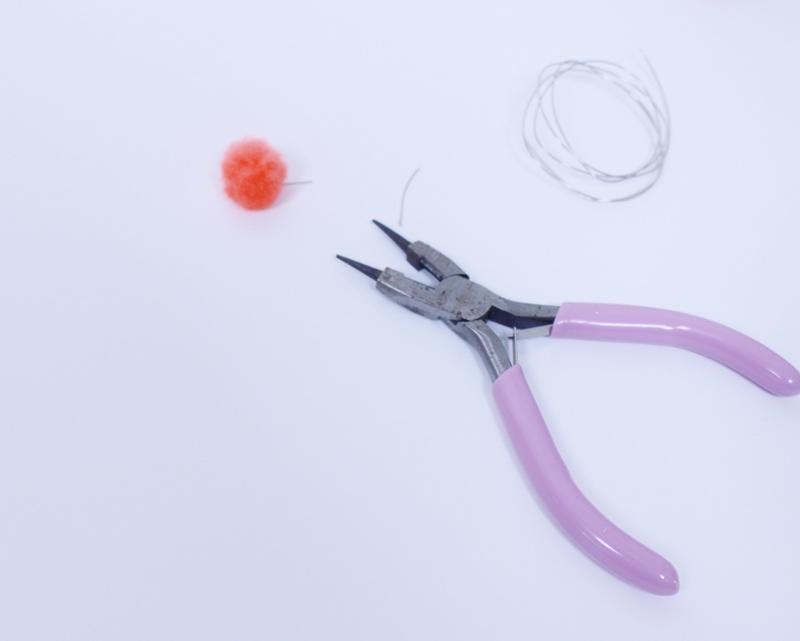 Cut the excess length off the eye pin and using pliers make a loop at the other end. Note, it must be large enough to slide over the laces. 3. 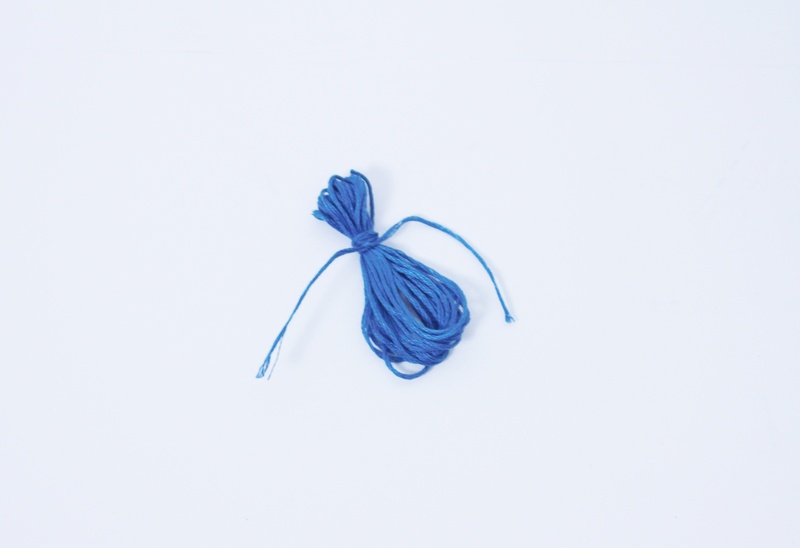 Slide the completed pom poms onto the laces at varying points. An alternate way is using jewelry bales and gluing the pom poms on then sliding those on to the laces. Bag- any style you wish, I chose a black square crossbows. 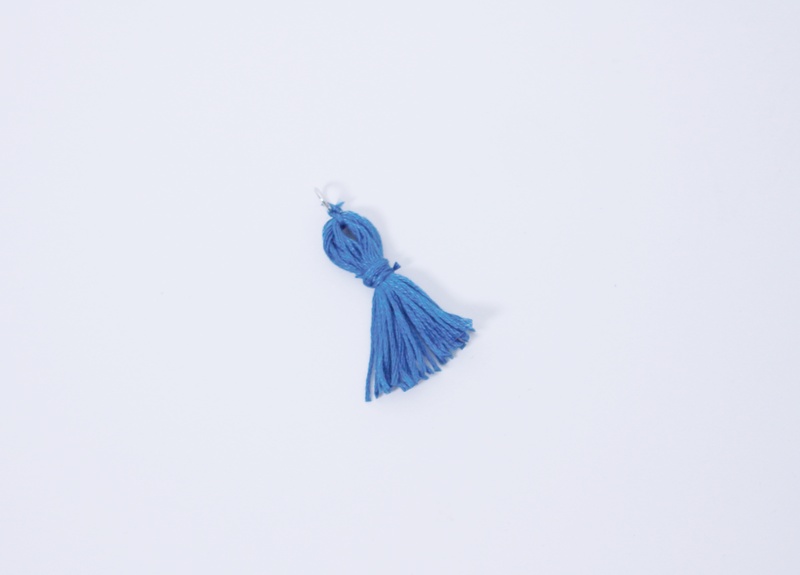 Tassels- you can make them the same way demonstrated above or use inexpensive ready made ones from a craft stores, like I am. Thread- I used embroidery thread since it was at hand. You can use rope or ribbon if you like. 1. Make a loop and knot it. 2. 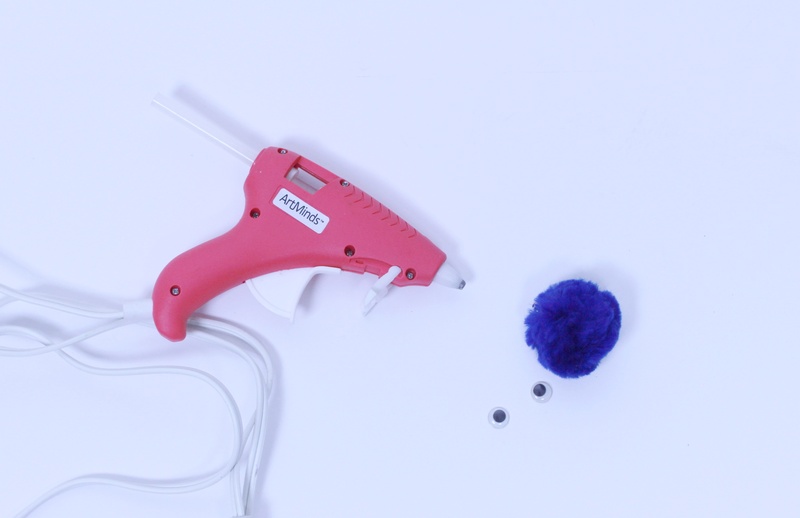 Add an eye pin to the pom poms. 3. 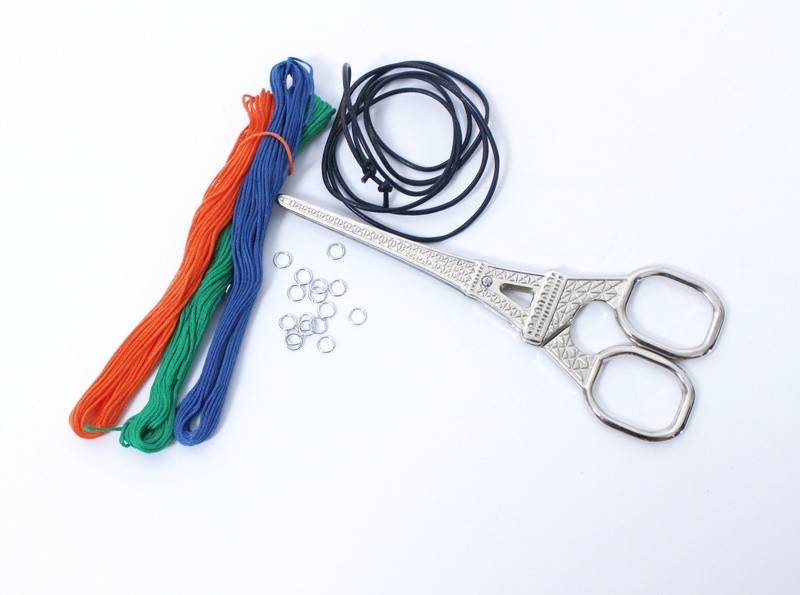 Slide onto thread and knot after each addition. 4. Add a jump ring to the top loop then add a keyring to the jump ring. I made this little cutie as a bonus. I’ve been seeing pom poms bag charms with eyes all over. This is great for a kid’s bag or for an adult with quirky taste. 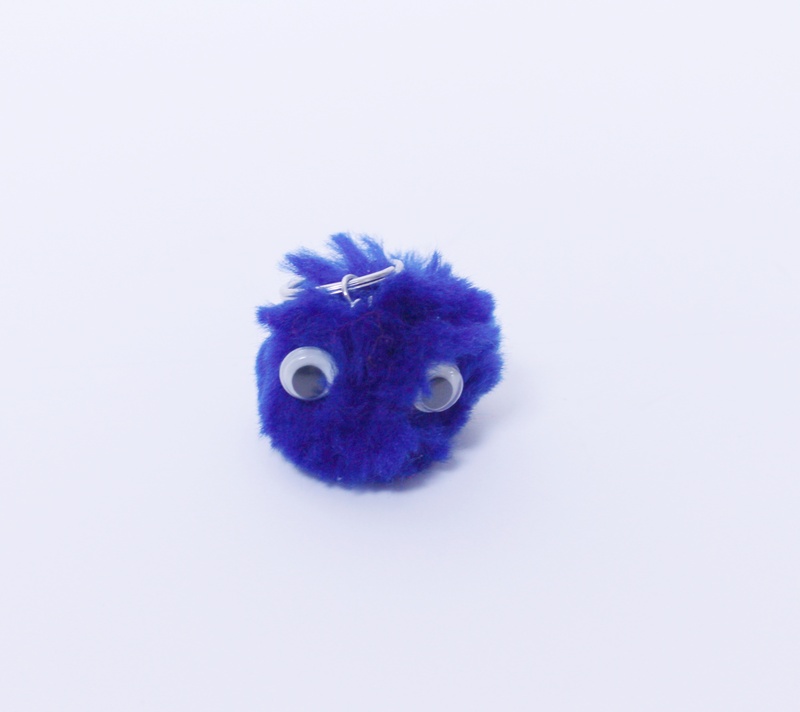 I used a larger pom poms, added an eye pin and a jump ring at the top, then a keyring to that and glued on the googly eyes. 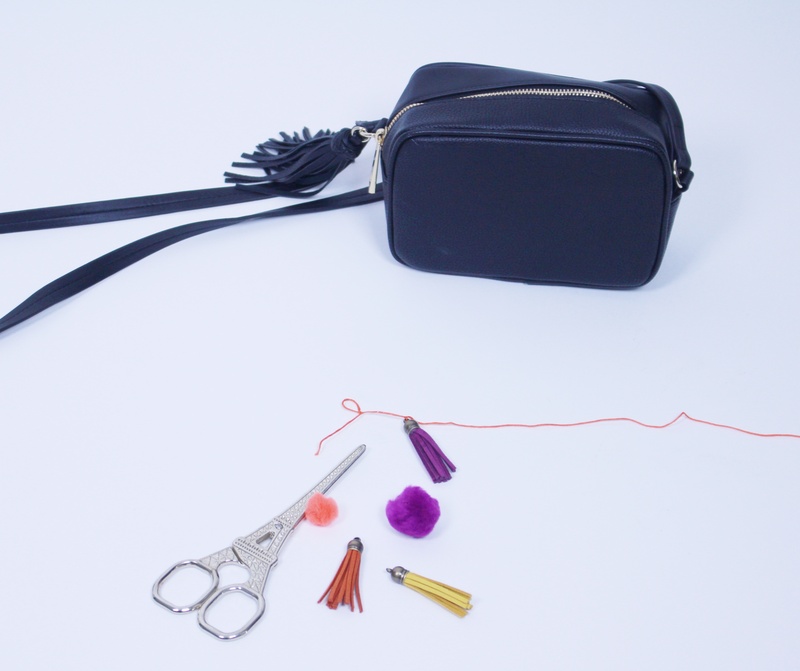 Whether you chose to DIY or buy, you’re sure to feel festive and trendy wearing tassels and pom poms. These look so cute!! I definitely will have to try them 🙂 Would make a great addition to some sandals for the summer! Interesting ideas and easy to follow illustration! Thanks for sharing!